To complement classroom theory with the specific guidelines of the local tax collection operation, 16 of this year's participating students also underwent a two-day training conducted by Ms. Maryann Olo, Revenue Agent 4 and Mr. Richard Jimmerson, Revenue Agent 5, of the local Tax Office. Between now and the end of tax season, each student will spend a minimum of 40 hours assisting the public to fulfill the course requirements. 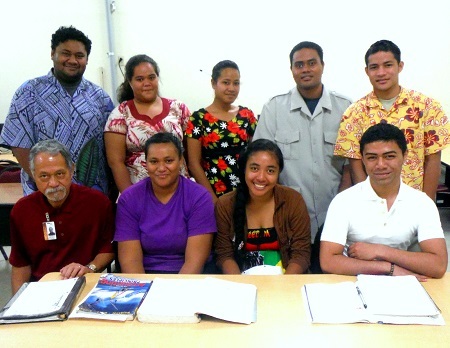 Students arrange their working hours at the Tax Office according to their class schedules, and Taua'i or other faculty from the Business Department make frequent visits to the work site to monitor their progress. As part of the grading process, the Tax Office submits a job performance evaluation for every student upon completion of their 40 hours, and traditionally, at the conclusion of the year's tax collection period the Tax Office has also awarded each participating student a Certificate of Appreciation. Students participating in the income tax filing project include Miranda Galo, Annie Fiatoa , Ester Iosefa, Irae Vine, Vaipuna O'Brien, Siana Aupa'au, Sia'ana Lam Yuen, Theresa Togia, Michelle Stark, Tala Lewis, May Siaosi, Si'itupe Paul Peko, Lydia Fatutoa, Vaosa Leifi and Irae Fuimaono. Anyone with questions on the tax assistance services provided by the ASCC Business majors can contact Taua'i at 699-9155, extension 382.